Fresh lychee has a rough, bright red shell. The creamy white flesh is juicy, smooth and delicately sweet. 1-2" in diameter. Pour a can of lychees into a bowl, mix with ice cubes and serve. We offer premium quality Aroy-D brand, noted as the finest in Thailand, packed in easy to open pop lid. 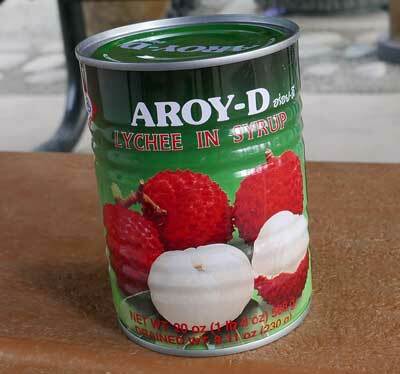 This is the best canned lychee on the market, always fresh. Ingredients: water, lychee, sugar, citric acid. More on lychees at this link. Product of Thailand. This recipe is unsuitable to freeze. You need an ice cream maker to prepare this delicious dessert.